I haven't been blogging, but I have been knitting... which means it's catch-up time! My birthday was about a month ago, and we spent it in New York. Jason's sister-in-law's baby shower was during the day and after everybody rested and recovered from that, the whole gang (Jason's family and mine) went out for dinner. Once we were all stuffed with steak, the waiter brought out a cake for my birthday! Cool, yes? Jason's sister is a trained pastry chef, and though she doesn't bake anymore she knows the most creative and festive bakeries in town. (Flour Girl Bakery made my cake.) 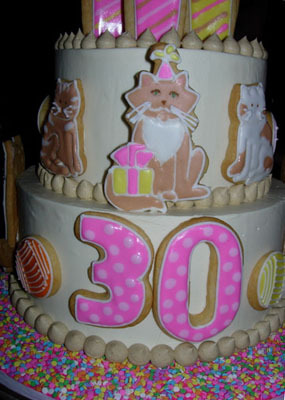 If you had told me that my cake would have cat cookies all over it, I would have probably scoffed... but this thing was like art. Even the candles were cookies! Here's the part that tickled me the most: between the cats were cookies in the shape of yarn balls. The next day, I showed Jason's sister my Nothin' But a T-Shirt, and she raved about it. At first I thought she was loving the theme of the tee (I am the "blushing" bride of her brother, after all), but it turned out she was just loving the tee in general. "Can I commission one of these? I'll pay for the yarn!" Sweeter words have seldom been spoken. R. decided she wants the main color to be chocolate brown and the contrast color to be light pink. She also wants long sleeves, which led to us nixing the contrasting color for the sleeve trim. Which, in turn, led to us nixing the contrasting color for the collar. She still does want a graphic embellishment in light pink, though. Considering all R. has done for me this year, I'm excited to knit her something she seems to genuinely want. Her birthday is in two weeks, so I'm knitting as fast as I can. 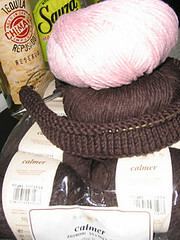 And because Jason is a good brother, he paid for the yarn as a birthday present for his baby sister. I can't keep my hands off this yarn -- I'm up to the armholes on the back already! Oh my! Now THAT"S A CAKE! And you are flying along on a NBaT! I am *slowly* getting my knitting to move a little quicker. :) and i have officially stopped looking down during boring stockinette. :) I like the chocolate with pink... a fave color combo for me. What's her graphic? I love yours! Holy cake -- happy birthday!! Your t looks great and the brown/pink combo will look excellent. The cake with yarn balls is ever so cute and how sweet that your soon-to-be sil loved your top and wants one made. That was nice that Jason bought the yarn. I love the colors chosen and the calmer looks like it's so nice to knit with. I've seen it once before in a LYS and just fondled it, but have yet to really work with it.